Giorgio Armani Eau Pour Homme is the great classics of men's fragrances. Giorgio Armani Eau Pour Homme 100ml. Eau De Toilette is the great classics of male perfumes. Its composition is sharp citrus aromatic one. Spontaneous and grand refreshment greets you at the top, brought to you by citruses: Sicilian mandarin, Californian green lemon, bergamot and petit grain (citrus leaf). The freshness of citruses is smoothened by orange blossom. At the heart there are elegant jasmine and lavender, accompanied by spices: nut, coriander, cinnamon and clove. The base is filled with warm sandalwood and masculine cedar, vetiver, oakmoss and patchouli that give the fragrance depth and natural feeling. It was created in 1984. The nose behind this fragrance is Roger Pellegrino. 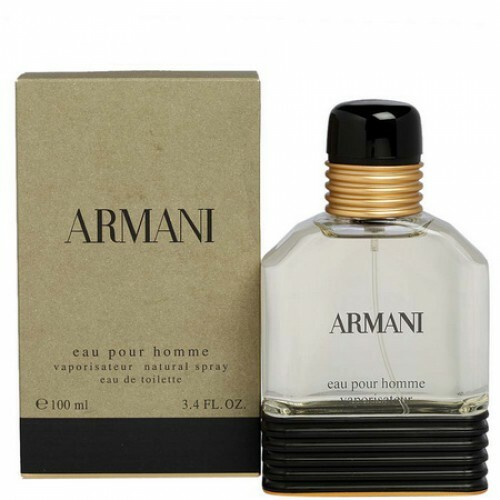 Armani Pour Homme pleases fans of classic stylish men's perfume for almost 30 years (the first fragrance went on sale in 1984,). During this time, the fragrance has already become the most popular perfume for men, released fashion house Armani. The brainchild of Roger Pellegrino became the quintessence of refined luxury, which has always been the hallmark Armani. He favored the most successful, the most famous men of the planet: actors, businessmen, athletes, politicians. And all this because Armani Pour Homme fragrance like no other, able to create around its host attractive aura courageous, bold and elegant man. The embodiment of elegance and masculinity - Eau pour Homme by Giorgio Armani. Eau Pour Homme from Giorgio Armani combines the notes of Sicilian mandarin, Californian green lemon and Italian bergamot with a cascade of strong spices and woody tones of sandalwood, cedar and oak moss. Rich and classic fragrance Eau Pour Homme from Armani with a clean citrus freshness reflects the refined luxury style of Giorgio Armani.